Fun Hut Crispy Waffle is a light batter cake cooked in a waffle iron, between two hot plates, patterned to give a distinctive shape, and topped with butter and various syrups. Crispy Waffle is a snack that fit for most of times. We can serve crispy waffle as breakfast, Hi-tea, Dinner and even a supper. This could bring you a higher profit business. 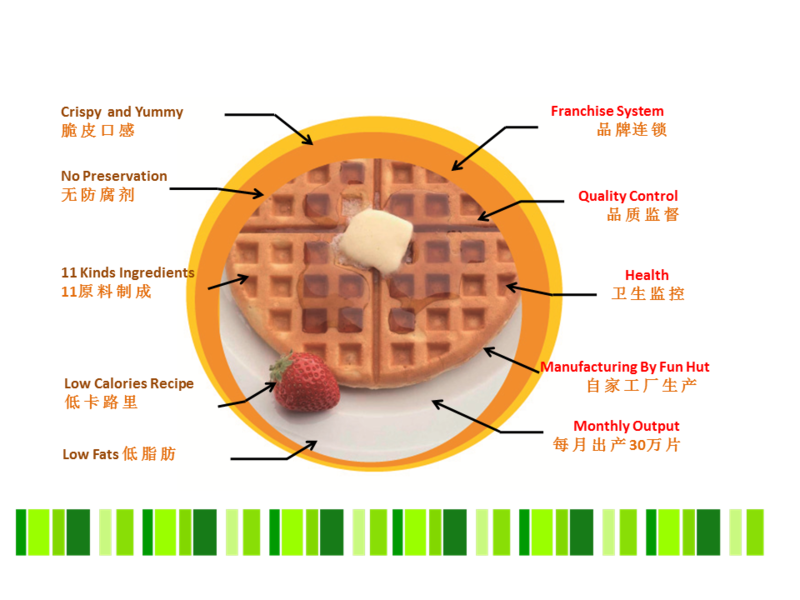 The ever growing market of freshly cooked of crispy waffles across the world and growing number of small outlets that offer freshly cooked crispy waffles and number of hotel and restaurant offering waffles indicate that there is an increasing demand of crispy waffle. People love crispy waffles. crispy waffles are irresistible but to be successful in busisness you need to get it right..
Our Crispy Waffle Cake is emphasized on low fats and calories recipe, however we still able to maintain crispy, and soft taste. Beside the normal flavors topping like chocolate, peanut butter, sri kaya (coconut jam ), we also have strawberry, butter, blueberry, kiwi, coffee, honey, ice cream various flavors spread The normal price range is between RM 1.80 to RM 3.00..
A good Crispy Waffle Cake is not only made by regular flours, Fun Hut Crispy Waffle Mix definitely is one of the best choices to help you last you business longer.